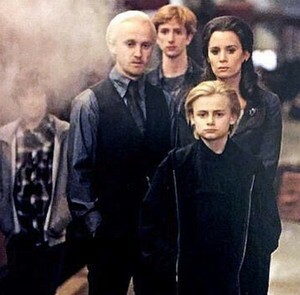 Draco Malfoy and family. with Teddy Lupin in the background. Wallpaper and background images in the Drago Malfoy club tagged: photo harry potter movie deathly hallows part 2 draco malfoy scorpio tom felton. This Drago Malfoy photo contains suti biashara and biashara suti. There might also be moshi screen, pazia la moshi, skrini ya moshi, smokescreen, nyayo, suti ya nguo, seti, seti ya nguo, wamevaa vizuri mtu, suti, suruali nyayo, pantsuit, mtu wamevaa vizuri, and suti ya suruali.